Today I'll be going history adventuring to Sedona, Arizona. I live in the Phoenix area, and it's really not all that far, but like most people I just can't seem to get away as often as I'd like. There's always something to do here, some project to finish, some errand to run. But unlike most of the people I've known in my life, who are much more responsible than me I guess, I do manage to get away. But there's a trick to it, and it may surprise you - there is no destination. When I tell people that I'm going somewhere, their first question tends to be "how long will you stay there?". Well, I'm not staying there at all. My adventure will be along the Arizona Highways. I could try to explain that just the view out of the window is so spectacular in Arizona that it looks like it was "just painted on", or when the sunlight hits the clouds just right I often joke that the sky looks "Photoshopped", but I usually just get blank looks. Another reaction I get when I tell people that I'm going somewhere is a recommendation for a restaurant. And yeah, I like restaurants, and I like to eat, but somehow that seems to change an adventure on an Arizona Highway into just waiting in line for a table. Heck, I can do that anywhere, and I have. My interest in waiting for a table in restaurants is slim, to say the least. Yes, I will do it, to be sociable, but really there are so many other things that I want to see. So I pack a lunch. I will be taking the backroads. If going to Sedona via Wickenburg sounds kind'a weird, all I can suggest is that you try it. Right up there with the top questions I get about my travels is "how quickly did you get there?" The fastest route, of course, is to take the freeway, rev up the speedometer, and pass all of the trucks as quickly as you can. But to me, that's a video game, which I tired of long ago. And my serious motorsport friends do that on a track, like Bonduraunt, not along the edge of a cliff. I've driven some seriously-fast cars in my day, and I really have no interest in doing that on a public highway. There is only one destination in life, and I realized that very suddenly at a young age. So I've been an enthusiast for the journey for quite a while, and the adventure starts the moment you look out of the window. Thank you for history adventuring with me. 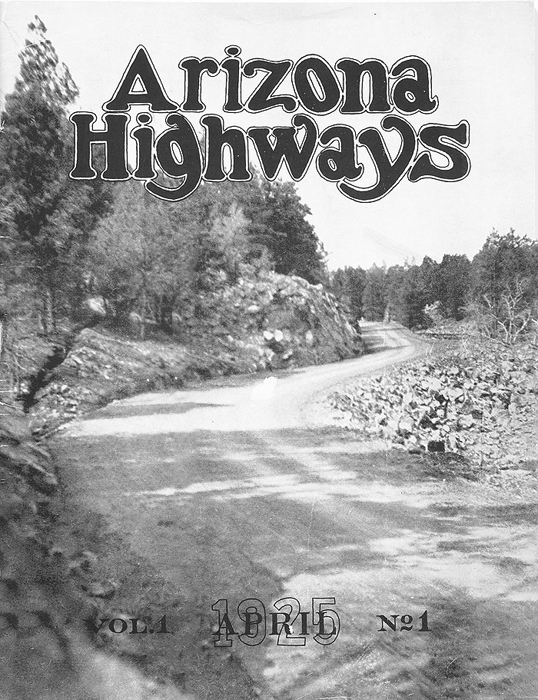 Image at the top of this post: The first issue of Arizona Highways, April 1925. 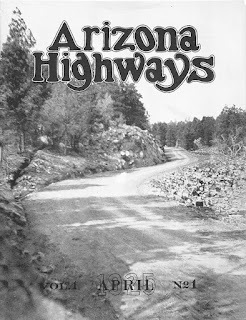 Like California Highways magazine, which no longer exists, it was published to encourage the building of highways to provide access to scenic beauty.